Capacity depends on the style and layout of your event. Max capacity using the entire property is 350 people. Talk to your event planner about the specifics of your event to see what work best. Parking up to 140 cars. A country chic custom ceremony pavilion designed with all ceremonies styles in mind. Seating up to 60. 12-hour rental period for full day rentals. Prep kitchen with residential refrigeration, stove, and oven. Private bridal and groom suite with a door that leads directly to the ceremony pavilion. Handicap accessibility for the entire property. Ample and clean restrooms stocked with a little something special for your guests. A reflective pool that is perfect for floating arrangements, and adding a touch of nature. Arrangements do need to follow a few rules so they don’t break the pool, check with your event planner. It’s the perfect season for your perfect event at Coyote Garden Hall. Personalized payment plans with no interest. On site event supervisor for questions, facility issues, and emergencies. We welcome approved catering and TABC certified bar services. If they are not already on our preferred vendor list, have them reach out to us and we’ll make sure they are up to date. Security detail for all events serving alcohol or with more than 100 guests is required. All outside vendors must carry insurance to be on our vendor list. 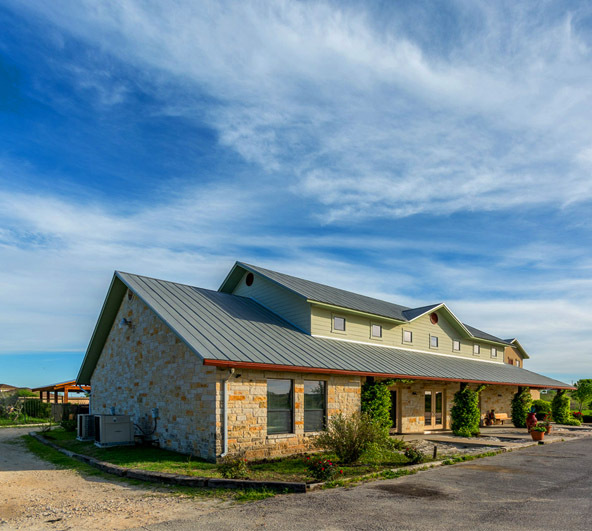 Whether you need a wedding venue or a relaxing outdoor space, a high-tech hall for a party or a conference center with a business-friendly environment, Coyote Garden Hall has you covered.